Welcome to the present moment. This project is primarily concerned with the Classic Mayan civilization of Central America. The information is broken up into several sections. 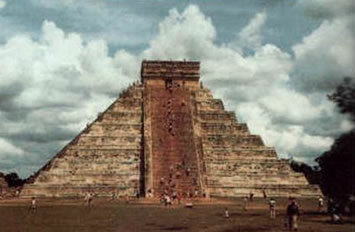 Firstly, we will explore the history of the Maya and their rise to civilization. We will then investigate the heart of their beliefs concerning the Universe in which they lived and their understanding of Time and Nature. We will connect their understanding of harmonic resonance with the basic structure of their system of mathematics. Once we have laid the foundation of their temporal perspectives, we will give a detailed analysis of a few calendar systems such as the Tzolkin, Haab, and the Long Count. We will also unlock several interesting aspects of the prophetic tradition within Mayan culture. As we will soon see, the implications and objectives of the Mayan Time-Science Project are not tied to the past, but are extremely applicable to our present age. This project is basically a survey of the Mayan understanding of natural time. We will address the importance of synchronizing with natural time and how this ancient/future technology can be applied. It is strongly recommended that the information contained within this project be considered with an open mind. The roots of the Mayan civilization can be traced back thousands of years to the Olmecs, an earlier civilization that inhabited an area along the Gulf of Mexico. 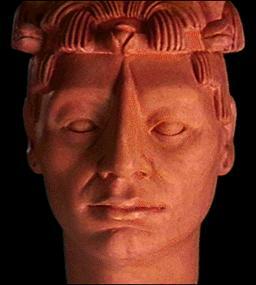 The Olmec, which means “rubber people,” date back to at least 4000 BC. They began their rise to civilization around 1500 BC, and are considered to have reached the first advanced stages of high civilization around 550 BC. The Olmec left behind many beautiful artifacts including stone and jade sculptures, many of which are characteristically related to the jaguar. It is presently believed that the Olmec stem from a late Neolithic shamanic culture which was based on the nagual, or spirit of the jaguar. The rituals of this shamanic culture included the consumption of psilocybin mushrooms, called by the natives, teonanacalt, flesh of the gods. The Maya are also preceded by the Zapotecs of Oaxaca. This group founded the great city of Monte Alban in southern Mexico as early as 600 BC. More recently, the Maya have roots in the Izapan culture which existed around the first century BC. along the south-western coast of Central America near present day Guatemala. Around 300 AD, in the jungle region known as Peten, which lies between Guatemala and the northern Yucatan, we begin to see the emergence of the Early Classic Maya. The spread of the Maya during this period led to activity within early sacred sites such as Uaxactun, Tikal, Palenque, Copan, and Quirigua. At the same time, the great city of Teotihuacan flourished in central Mexico. Teotihuacan, “place where the gods touch the Earth,” is home to the Pyramid of the Sun and became a major center of the religion of Quetzalcoatl, the Plumed Serpent. The Teotihuacan cultural influence spread through Mesoamerica and trading was established with the Maya throughout the third and fourth century AD. Infused by the mythic conception of Quetzalcoatl, called by the Maya Kukulkan, the Mayan civilization stepped into high gear, initiating what is known as the Late Classic Period. It is in this era, which began approximately 500 AD that the Maya built their beautiful stepped pyramids and created many stone markers which illustrated their mathematical understanding of the cosmic cycles of nature and time. The Classic Maya achieved a distinctively characteristic form of art, including architecture, sculpture, ceramics, feather-work, cotton weaving and dyeing. Moreover, they are primarily remembered for the development of a calendar system which is not only as accurate as the Gregorian Calendar, but far more superior. The Maya also achieved an understanding of astronomy and mathematics which surpassed the Babylonians and possibly the Egyptians; all without the use of telescopes or any other form of external material technology, including metallurgy and the wheel. This period of advanced civilization lasted until about 830 AD, at which point the Mayan civilization as it was abruptly transformed in a number of ways. This period following this transformation can be referred to as the New Empire, or late Maya. By the end of the tenth century AD, the center of Mayan life had shifted to the northern Yucatan. Also, there was a shift in their activities. No longer did they construct huge stone monuments recording countless dates and relationships of temporal cycles. Instead, there was the emergence of a shorthand notation of the calendar system and the records were kept, not in stone, but in hieroglyphic manuscripts called codices, of which only four survive. This period is further characterized by a rising frequency of human sacrifice and warfare as well as the formation of new political alliance known as the League of Mayapan. The Postclassic Maya divided into tribute-collecting states. The overarching mythic concept which connected these states was the Plumed Serpent, Quetzalcoatl. The divine king Plumed Serpent represented a deity figure. 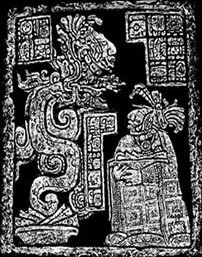 However, Quetzalcoatl was also a man who lived amongst the Maya during the end of the tenth century AD. During the Postclassic period, the Mayan culture fused with the Mexicans whose native language was Nahua. The Mayapan dissolved due to internal warfare in 1441 AD. At this point the Mayan Civilization had become quite fragmented, and by the time the Spanish arrived in the sixteenth century AD, the memory of the Classic Maya had all but vanished without a trace. 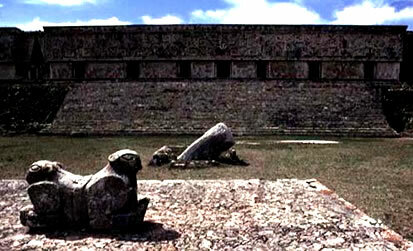 All that remained of the Classic Maya were the silent stone carvings and pyramids. The Spanish conquistadors quickly wiped out most the native population. The invaders instigated huge massacres and unwittingly spread many diseases throughout the area. The surviving Maya, in attempts to keep their culture alive, learned to use the symbolism of Christian saints as masks for their ancient gods. The Mayans also learned to use the Roman alphabet as a mask for their sacred texts. In this way, coded remnants of their earlier stage of advanced civilization have trickled down into present times. One thing that is becoming increasingly clear is that the Maya had a stake in something well and beyond anything that we Westerners originally gave them credit for. Despite centuries of efforts aimed at stomping out this culture completely, a few key elements of their understanding have persisted throughout it all. These keys, which the Maya left behind, are of critical importance and direct relevance to our present situation as a species. The situation on Earth concerning the human race has become critical. However, although it may not be directly obvious within this dimension of matter, there is a larger drama unfolding before our very eyes. The doorway to infinite possibility awaits each and every one of us. The sun will be reborn only if we can remember what it means to be children of the light. From our perspective, the Mayan Civilization existed in what we call the past. Anyone interested in seeing things from their perspective would be well advised to suspend any intellectual judgments, for indeed it would be impossible to understand the Maya from a purely Western mentality. Having outlined the chronological and geographic details concerning the emergence of the Maya, let us now tune into what this amazing civilization was all about. Let’s start from the beginning. The Mayan word ge symbolizes the beginning, the source from which all life manifests. Ge represents the egg and literally translated means zero. For the Maya, the concept of zero is the basis of their counting system, as we will see. Moreover, the spiral form of the G symbolizes the source of our existence, the Milky Way. The G can be accessed very easily through the symbol of Hunab Ku, which represents the center of the galaxy, or the heart of galactic consciousness. Hunab Ku can be translated as “One Giver of Movement and Measure,” and is conceptually equivalent to God, Great Spirit, or Absolute Being. The Maya understood that everything comes from and returns to the One Source. Granted there are countless galaxies and super clusters swirling through the cosmos. Yet, we may find it reasonable to agree that a galactic perspective is a sufficiently large frame of reference for human comprehension at this stage of evolution. This Hunab Ku is the Heart of All Beings and each of us is connected through our own hearts. In fact, it is impossible to be disconnected. It is through this resonant circuit that the center of the galaxy transmits all evolutionary programs and memory patterns to each respective star system. The Sun, in turn, focuses these vibrations down even further into the various planetary bodies within the solar system. It is essential to remember that in the Mayan perspective, everything travels in both directions simultaneously. This is known as the Zuvuya principal. The Zuvuya represents the Universal memory circuit which extends from and returns to the Source of Infinity, thus connecting everything back to its Self. Thus, from the perspective of the Galactic Maya, there is one Source of all energy which is divine consciousness. This ener-Ge, or divine consciousness, manifests itself as an infinite number of possible forms throughout all dimensions. Each possible form is a frequency vibration; indeed all matter is essentially interconnected waves of energy. So, unlike our culture which is obsessed with matter, i.e. physical science and materialism, the Maya based their understanding of reality on frequencies, vibrations, and harmonies. As we move into the basics of Mayan time keeping, it will be helpful to remember that we’re talking about frequencies and harmonic resonance. Indeed, numbers within Mayan mathematics do not specifically relate to quantity, as is usually assumed; all numbers, including zero, represent different frequencies and tones. For the Maya, time was viewed as an endless web of cycles within cycles, all connected by an infinite spiral of eternal now: the Zuvuya. They placed considerable significance in the convergence of two or more cycles. In addition, each representation of time, whether that of a glyph or number, held a specific archetypal or spiritual energy that was considered sacred. The basic unit of time in the Mayan calendar is called kin. This word means day, sun, person, and relative. The Maya track temporal cycles one kin at a time. Mayan mathematics uses a base 20, or vigesimal, counting system that begins with zero (i.e. 0-19). A kin also means 20 days; thus, all Mayan cycle calibrations can be expanded by factors of 20. Actually, there were two such vigesimal systems. One is a pure vigesimal system (i.e. 1, 20, 400, 8000, etc. ), while the other is a relative cycle which is based on 20 except for the second term which is based on 18 (i.e. 1, 18, 360, 7200, 144,000, etc.). This second system is actually base 9 because all the numbers numerologically at up to 9. The Maya understood and used at least 17 different calendars. For the purposes of this report we will take a look at a few of these and how they are interrelated. The key calendar that we want to access is called the Tzolkin, or sacred count. In general, the Tzolkin is a perpetual 260 day calendar created by the permutations of 20 symbols and 13 numbers. 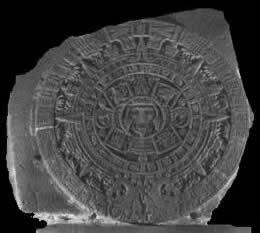 Interestingly, the origin of this calendar can be traced back to the Olmecs and is still in use today by modern Maya living in the Guatemalan highlands. In other words, this calendar has been in use by human beings for at least 3000 years. This cycle is not based on the movement of our Sun, the Earth, or any other planet in the solar system. The Tzolkin is synchronized with the movement of energy and consciousness within our galaxy, and can be referred to as the galactic spin. All the other cycles of stars and planets are built into, and follow from the Tzolkin. The Tzolkin reflects the Hunab Ku, the conscious center of the galaxy. The Maya believed it was necessary to align oneself with this energy to attain spiritual harmony in life and with nature. The Tzolkin is a powerful tool which can be utilized for retrieval of galactic information. It can also be used to synchronize your self, through resonance, with the galactic whole. As mentioned above, the Tzolkin is actually a matrix formed by the possible combinations of 20 day glyphs, also called solar tribes, and 13 sacred numbers. Consequently this count can be understood as twenty 13-day cycles or thirteen 20-day cycles. (refer to the figures on next two pages) To count days, one begins in the upper left corner and progresses down the column. Once you reach the bottom of the column you begin at the top of the next column to the right and continue in this way until you reach the bottom right hand corner. Each of the 13 numbers represents a resonant pulsation of the galactic being, or Hunab Ku. Each pulse carries a particular radiant energy. Similarly, the 20 day glyphs represent different tones or frequencies, each of which is supersaturated with meaning. 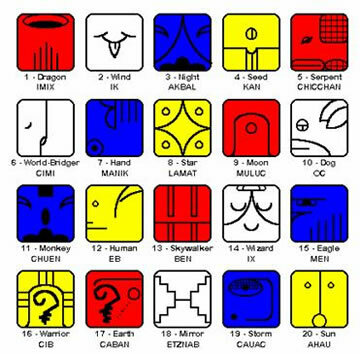 As a series, the 20 glyphs describe the unfolding process of life itself. For example, the first glyph is Imix, which is the Dragon, Source of Life, and Mother. The last glyph is Ahau, which is the Sun, represents completion, union, wholeness, enlightenment, and transcendence. 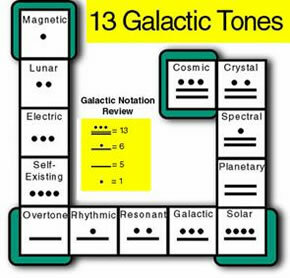 (for more detailed descriptions of the 13 pulsations and 20 frequencies refer to the pages at the end of this report) In the context of harmonic resonance, the 20 glyphs represent the cycle of frequency-range possibilities that each of the 13 galactic pulsations may undergo. There are a couple obvious patterns generated by this matrix. We’ve already noted that there are twenty cycles of 1-13. This cycle of 13 days can be called a wavespell. The 260 days can also be seen as four seasons of 65 days each. Another significant subcycle within the Tzolkin is a period of 52 days called a castle, of which there are five. In addition, cycles of four days represent the four directions; east, north, west, and south respectively. The entire 260 unit grid, 20 rows and 13 columns, is held together by 52 specific days which create a frame for the entire structure. These 52 units, or resonate nodal intersections, are called galactic activation portals (GAPs) and represent days of more intensified galactic activation. The framework created by these portal days is called the Loom of Maya and resembles the double-helix pattern associated with our DNA. In order to get a better perspective, lets step back and consider the Tzolkin in the broadest sense. The 260 unit matrix of resonate frequencies creates a non-linear holographic pattern. Although we count one day at time in a linear fashion, the overall pattern is non-linear because each day feeds back into and is effected by all other days. The entire pattern is infinitely interconnected with itself. The result of this property concerning resonate interconnection is that each unit essentially contains the whole pattern. This is a fundamental property of all holograms, mainly that the whole is contained within each part. Moreover, because the Tzolkin integrates the 13 galactic pulsations and the 20 frequency possibilities within each pulsation, the entire matrix defines the smallest field of possibilities and permutations which codes and accommodates for all manifestations of being within our galaxy. Simply put, the Tzolkin is a multi-dimensional holographic reflection of the Hunab Ku. In effect, the 260 unit harmonic circuit of the Tzolkin codes for many levels and scales of reality simultaneously. The following represent a few simple examples of this property of the Tzolkin. For instance, humans have 20 fingers and toes. There are also 20 essential amino acids from which all biological life is composed. There are 13 months in one lunar year. The number 13 also represents harmonic ascension, that is, there are 12 notes in an octave plus the 13th which returns you to the first note in the next octave. The number 260 also represents the 260 day period of human gestation within the womb. We can also apply the Tzolkin to the behavior of celestial bodies. The synodic revolution of Venus is a period of 584 days, which equals 2.25 times 260. The synodic cycle is a measure of a celestial body’s rotation relative to Earth. Similarly, the synodic revolution of Mars is a period of 780 days, which equals 3 times 260. The synodic period of the moon is 29.5 days, 44 cycles of which equal roughly 1300 days, which equals 5 times 260. There is also a direct relation between our sun and the number 260. The solar system is a self-contained organism. The totality of the sun’s gravitational and electromagnetic field, encompassing the orbits of the planets of the entire solar system, create the solar aura which is known as the heliocosm. This energy field of the solar system pulses outward every 11.3+ years, and then for another 11.3+ years the heliocosm pulses inward. These 11.3+ year inhalation-exhalation periods of the solar body are referred to as the heliopause. One full solar breath occurs once approximately every 23 (11.3 x 2) years. The heliopause also directly relates to the activity of binary sunspots which behave according to the same period of 11.3+ years. Well, 16 times 260 days equals 11.3+ years. Also, 11.3 times 23 years equals 260 years. This report primarily concerns the Tzolkin and larger cycles of time; thus, we will see more of these applications very shortly. Another calendar system used by the Maya is the Haab. This cycle is 365 days long, a vague solar year, and is usually counted as eighteen months of twenty days each, with a nineteenth month of five days added on at the end. Whereas the Tzolkin is known as the sacred calendar, the Haab is a calendar used in common life and agricultural applications. 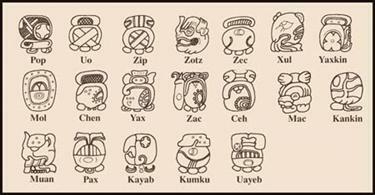 The following illustration shows the nineteen month glyphs and their names. The Tzolkin and Haab cycles are used together, and thus a single day will bear a date from each of these calendars. Consequently, because one cycle is 260 days and the other is 365 days, the least common multiple of these cycles creates a cycle of 18,980 days. In other words, the Tzolkin and Haab synchronize once every 18,980 days, a period which equals 52 Haab or 73 Tzolkin. This cycle of 52 vague solar years is called the Calendar Round. This cycle can be considered one solar-galactic year since we are synchronizing the galactic and solar day counts. This period of 104 years is called the Venus Round, and the day of the morning star appearance on the eastern horizon was known as the Sacred Day of Venus. Using this system of natural cycles within natural cycles, the Maya were able to keep track of periods 104 years in length. Also, the basic structure of this system allowed the Maya to easily predict solstice and eclipse dates. The harmonic system of the Venus Round became fragmented during the Spanish Inquisition and is no longer in use. 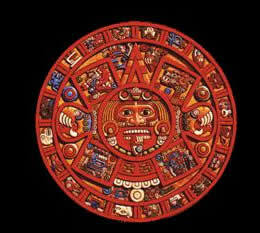 However, the basic structure of the 52 year Calendar Round is still in use by the Maya living throughout Mesoamerica. In order to synchronize even larger cycles of time, the Maya devised what is known as the Long Count. This aspect of their calendar system is based on counting the number of days that have elapsed since the beginning of the Long Count cycle. Before we talk about the significance of this calendar, let’s discuss the manner in which the Maya counted these days. As mentioned earlier, the Mayan word for day is kin. The Long Count is based on the relative vigesimal expansion used by the Maya. Twenty kin make a uinal. Eighteen uinal make a tun, which equals 360 kin. Twenty tun make a katun, which equals 7,200 kin, or approximately 19.7 years. Twenty katun make a baktun, which equals 144,000 kin, 400 tun, or approximately 395 years. Note, each place value represents a multiple of twenty except for the tun, which is a product of eighteen months of twenty days. The date in terms of the Long Count indicates how many days have elapsed since a zero date which is written as follows, 0.0.0.0.0. From left to right, the place values are baktun, katun, tun, uinal, and kin respectively. For example, 6.17.12.0.0 is read 6 baktuns, 17 katuns, 12 tuns, 0 uinals, and 0 kin. If we add all these up we find that this sample date indicates 990,720 days have elapsed since the beginning of the cycle. To give another example, the Long Count date corresponding to the day on which these words were written (3/14/2001) is written in the following way, 12.19.8.1.0. For reasons that will become clear, the Long Count is also called the 13-baktun cycle. That is, the cycle begins on 0.0.0.0.0 and ends after the completion of 13 baktuns on the date 13.0.0.0.0. This cycle, also called the Great Cycle, lasts exactly 1,872,000 kin, 260 katun, 5200 tun, or approximately 5125.36 years. After years of considering data from archeology, ethnography, iconography, and astronomy, Mayanologists have determined that the date 0.0.0.0.0 corresponds to the Julian date 854283, which equates to August 11, 3114 BC in the Gregorian calendar. Interestingly, the inauguration of the Long Count system dates back to around 2000 years ago. The end date, 13.0.0.0.0 corresponds to the date December 21, 2012 AD. A point not thoroughly considered is this: the date 13.0.0.0.0 is equivalent to the date 0.0.0.0.0. The cycle returns to the same time that it started. The easiest way to visualize the Great Cycle is to remember that the Tzolkin can be applied to different scales without distorting the pattern. That is, the proportions of the 20 tones and 13 pulsations remain constant as we zoom in or zoom out of different size reference frames. As mentioned above, the Great Cycle equals 260 katuns, thus the Tzolkin can be used to map this larger cycle by allowing each unit to equal one katun. We’ve already mentioned that days can be expanded by multiples of twenty. Therefore, the Great Cycle can be viewed as a set of thirteen baktuns, or columns, where each baktun contains 20 katuns. (see figure on following page) The Maya considered the period of this Great Cycle to be equivalent to a World Age, or Sun, and thus the 5200 tun Long Count reflects a creation epoch. The Great Cycle of the Mayan calendar definitely has relevance to something, but what? If we look back into the past we will rediscover that the event which coincides with the beginning of the Great Cycle is none other than the birth of written language. This time in the evolution of our species represents the commencement of history itself. The period from 4200 to 3000 BC also coincides with the rise of patriarchy which ended the peaceful goddess culture that existed before history during the Early Neolithic. When the 13 baktun Great Cycle is viewed from the perspective of the 260 unit structure of the Tzolkin we immediately see that history itself is a harmonic function that can be mapped using the 20 frequencies and 13 pulsations. The reasons why this idea makes sense should become more obvious to anyone who studies the subject intimately. Let us consider, for a moment, that the entire historical process can be represented as a waveform. This wave harmonic can be broken down into 13 sub-waveforms, each of which codes for a characteristic patterning of historic activity. Each baktun progresses through all twenty frequencies that are represented by the solar tribes. The transformational process of history unfolds itself over thousands of years. Thus, subtle patterns within the dynamic unfolding often elude the perception of any individual human which is experiencing the drama from within the third-dimension. With a little bit of re-tuning of one’s focus, the patterns of larger cycles may jump out at you. Lets consider the present day in relation to the Great Cycle. We are currently in the 12th and final baktun of the cycle. It should be noted that the baktun is not counted until it has elapsed; therefore, the first baktun was numbered zero, and the date 13.0.0.0.0 will occur after the completion of baktun 12 on 12:21:2012. Within this final baktun of the Great Cycle, we find ourselves in the midst of the final katun. This katun, in the bottom right-hand corner of the Tzolkin as Great Cycle, bears the name 13-Ahau. This intersection of the 13th sacred number and the 20th solar frequency creates a combined meaning that can be translated as “transcendental enlightenment” or “cosmic ascension.” Interesting huh? Baktun 12 dates back to 1618 AD. This is the time period of Galeleo, Kepler, and Descartes, and indeed the birth of scientific materialism. Four hundred years; it seems about as far back as any one can remember, yet it was only a moment ago. 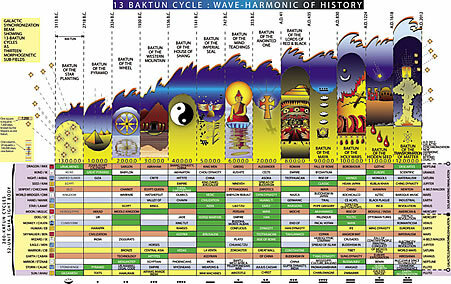 From Newton, to the Industrial Revolution, through colonialism, electricity, World Wars I and II, the nuclear era, the birth of computer technology, and space travel; the wave of this baktun represents the cresting of the entire Great Cycle of history. In this short period of time we witness an awesome compression of exponential acceleration which is reflected through transformations in technology, art, and nature, not to mention the conscious reality experienced by the collective mind of the human race. Indeed, at this point in the game everything is changing and transforming itself faster and faster, moment to moment. This accelerated flux of change, and the perspective of the entire cycle of history, is only perceivable toward the end of the cycle, as the acceleration of change overflows into unexpected novel occurrences which reflect the synchronic order of the larger whole. Speaking from my intuition, the harmonic ascension of the human race through the 5200-tun cycle corresponds to a certain field of evolutionary growth within the planetary mind of goddess Gaia. It is essential to remember that we are all minute projections of Her being. On an even broader level, this planetary reality is a minute projection of the galactic being, our Cosmic Mother, which is the source of all evolutionary programs, resonate transmissions, and memory seeded throughout respective star systems within the Milky Way, via the Kuxan Suum. This is also why the Great Cycle can be mapped using the Tzolkin, or galactic spin. The purpose of this cycle, which the Maya calibrated and mapped as the Long Count, was specially engineered to raise the frequency of vibration of humanity, the planet, and the solar system through a quickening and transformation of matter. This cycle climaxes when the entire historic process converges in the direction of the now, beyond the third dimension. As the Earth moves into a higher vibrational state, our collective reality will phase into synchronization with the larger galactic frame of reference. The living tapestry of history is woven by an incomprehensible number of threads. However, the entire pattern appears to be spiraling in the shape of a steep spiral which culminates at the projected Long Count end date of Dec 21, 2012. Indeed, at this point we are experiencing the convergence of all dimensions of history. This subject leads directly to many transcendental implications. The actual event, galactic synchronization, which occurs at the end of history will remain a mystery until it is experienced directly in the present moment. However, the nature of this experience is not inaccessible. It has been slowly coming into resonance over thousands and thousands of years. In order to obtain a clear perspective with good resolution, it should be remembered that this event marks the culmination of our entire history; thus, an accurate picture can be constructed by synthesizing, and making connections between all cultures around the world present and past; their cosmologies, their use of symbols, and their rituals. In this way, the big picture of human history is accessible. This project concerns the classic Maya; thus, we will focus on a few threads of the tapestry within Mesoamerican history and how they are interwoven. Hopefully, this investigation will shed some light on the significance of the 2012 Long Count end date. Despite the many records carved in stone throughout Mayan cities, much of this culture remains a profound mystery. The main reason for this is the Spanish. Not only did they come to the Yucatan some 700 years after the Classic Maya, thus never aware of the previous stage of advanced civilization, but they made it their personal mission to destroy all that remained of the once great culture of the terrestrial Maya. Throughout the period known as the New Empire, the Maya had created many hieroglyphic texts on folding sheets of paper. Of these only four survive. They are known as the Dresden, Madrid, Grolier, and Paris codices. All the rest were burned by Spanish conquistadors and Christian missionaries. In addition to these codices, a few texts that were written after the Spanish conquest have survived. These are the Popul Vu, and the Books of the Chilam Balam. 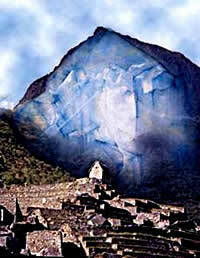 The Books of the Chilam Balam are the translated works of a prophet which lived around 1500 AD. This prophet’s name was Chilam Balam, which means Jaguar Priest. The prophecy of the Chilam Balam supposedly foretells the Spanish Invasion, and gives details of the diseases and war that were to come. 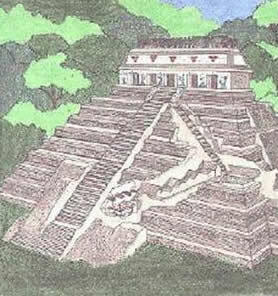 The prophecy cycle of the Chilam Balam is based on a shorthand version of the Tzolkin as Great Cycle. Remember that there are 20 cycles of 13 katuns. A cycle of 13 katuns equals 260 tun, or approximately 256 years. Interestingly, two conjunction cycles of Uranus and Pluto equals 256 years. Also, 3 katuns equal exactly 37 synodical cycles of Venus. This 13 katun cycle interpenetrates and runs parallel to the cycle of 13 baktuns. The 13 katun cycles are known as the Ahau cycles. They are named Ahau because each katun ends on the day Ahau, but on different numbers. The first katun ended on 11 Ahau and is named 11 Ahau. The next katun in the cycle is 9 Ahau, followed by 7 Ahau. Each katun is numbered 2 less than the one before it. Each of the 13 katuns was associated with a certain fate, and the Maya believed that the arrival of each katun brought with it this fate. The Chilam Balam not only warned the Indians of the disasters and hardships that would occur, but prophesied the return of ancient glory and universal harmony. We will now look at the prophetic tradition of the Maya which precedes the Spanish conquest. The most well known prophetic icon in Mesoamerican culture is the sunstone calendar which depicts the five ages. Along the circumference of this image we find the twenty day glyphs that we’ve been talking about. The four square boxes located around the center circle symbolize the four previous ages. The figure in the center represents the present fifth and final age. As described in the previous section, a world age can be represented by the 5200 tun Great Cycle. Five Great Cycles (5 x 5200) equals one Grand Cycle of 26000 tun (remember 1 tun equals 360 days). The details of the creation and dissolution of these five ages are summarized in the Popul Vu creation myth. This cycle, slightly less than 26000 years, is specifically related to the precession of the equinoxes, which is caused by the 23 degree tilt in the Earth’s axis. As the Earth orbits the sun, it wobbles like a top, exhibiting a property known as precession. The orientation of the north pole, which is currently aligned with Polaris, traces an ellipse against the background of stars. The 26000 tun cycle can also be mapped using the Tzolkin by allowing each unit to equal 1000 tun, or 50 katuns. This is indeed another astonishing application of the Tzolkin. From this perspective, we are not only nearing the end of the Great Cycle of history, but we are about to close out an entire 26000 year Grand Cycle period of evolution. Interestingly enough, if we look back 26000 years we find ourselves in the times of Cro-Magnon man which preceded Homo Sapiens. Perhaps the 260 day gestation period of an individual human can be correlated with a 26000 year gestation period of the human species. A paramount figure in the prophetic tradition of the Maya is a man known as Pacal Votan. Pacal Votan was a great Mayan king and his rule extended over a vast area of their civilization. Pacal was born in 603 AD and lived during the era of the Classic Maya. He acceded to the throne in 615 AD at the age of 12. Interestingly, the period from 631 - 683 AD is significant. This 52 year period represents Pacal’s era of power, which is actually the seventy-third 52 year cycle since the beginning of the Long Count in 3114 BC. He died at the age of 80 in 683 AD and was entombed in the Temple of Inscriptions at Palenque which was dedicated in 692 AD. Part of his legacy, left behind after his death, includes the Lost Book of the Seven Generations which is mentioned in the Books of the Chilam Balam. The “Seven Generations” refer to the 138 year period from the dedication of Pacal’s tomb to the end of the ninth baktun, which ended in 830 AD. In the Long Count this period lasts from 9.13.0.0.0 to 10.0.0.0.0. These seven generations represent the peak of the Mayan time-science project. The result of which was the recording in stone of their astronomical and mathematical calibrations. The end of this baktun also marks the end of the Classic Maya. Following the end of the ninth baktun were the thirteen years of emptiness, or forgetfulness (830 – 843 AD). 843 AD marks the beginning of another prophetic cycle called the thirteen heavens and the nine hells. Each of these heaven and hell cycles is a period of fifty-two years, the length of a Calendar Round. Thus, the thirteen heavens lasted from 843 – 1519 AD, ending right before the Spanish invasion. The nine hells lasted from 1519 – 1987 AD. The end of the ninth hell cycle on August 16-17, 1987 corresponds to what has become known as the Harmonic Convergence Global Meditation. The Harmonic Convergence signaled the final twenty-five year countdown to 2012. We’ve seen that the Long Count, the Mayan Sunstone, and the prophetic legacy established by Pacal Votan all point to 2012 as a date of great importance, but why? Let’s look again at the figure of Pacal Votan to see if we can find any clues. As mentioned above, Pacal’s final resting place was in a tomb below the Temple of Inscriptions. Archeologists encountered this tomb after they discovered a secret stairway that let down into the heart of the pyramid. The tomb was unearthed in 1952 AD after three years of work removing boulders that had been used to block the entrance of the stairway. Within the tomb, archeologists encountered a 30 ft by 13 ft wide stone slab which appeared to be an alter resting on the floor. This stone turned out to be the sarcophagus lid of Pacal Votan. The ancient Mayan word for tree is te and is symbolized everywhere throughout their culture by the letter T. The symbol T is also identified with the second of the 20 sacred day glyphs and is known as Ik, which represents spirit, wind, or divine breath. The Sacred Tree also represents the Axis Mundi, or Universal Axis. The Axis Mundi is the connection to the spirit world, as well as the connection between Heaven and Earth. The Sacred Tree plays an important role in Mayan cosmology and astrology. We’ve noted the strong relationship and connection between the Maya and the Milky Way. From their terrestrial perspective, the Sacred Tree was seen as the crossing point of the ecliptic with the band of the Milky Way. The ecliptic is marked by the path of the Sun and the planets. The intersection of the ecliptic and the Milky Way also represents the sacred doorway to the underworld as well as the sacred source and origin of creation. The Quiche Maya of Guatemala referred to this celestial feature as Xibalba be, which means “road to the underworld.” It was also known as the Black Road or the Crossroads. This “road to the underworld” is also closely related to a feature of the Milky Way known as the Dark Rift. The Dark Rift is also known to be the birth canal of the Cosmic Mother. This rift is actually a portion of the Milky Way which appears black because of the dense interstellar dust clouds which obscure visibility in the direction of Galactic Center. For this reason the Galactic Center is invisible to our telescopes. Lord Pacal is seen on the sarcophagus lid with the Sacred Tree. The significance of this imagery is quite astonishing. The Mayan word for Lord is Ahau, which also means Sun. The relevant connection between the Sun, the Sacred Tree, and the Mayan Calendar is shockingly simple. Researchers have discovered that the end of the Mayan Long Count coincides with a rare alignment between the Earth, the Sun, and the Galaxy. Specifically, the alignment we are talking about occurs when the winter solstice Sun of the year 2012 AD conjuncts the Sacred Tree (formed by the intersection of the ecliptic and the Milky Way). To be more precise, the solstice Sun aligns with the ecliptic and the galactic equator, which is the imaginary line that marks the center of the Milky Way band. Presently, the Milky Way crosses the ecliptic through the constellation of Sagittarius, which also happens to be the direction of Galactic Center. In other words, on the morning of Dec 12, 2012, we will witness the heliacal rising of the Galactic Center with the winter solstice Sun as they emerge together over the Eastern horizon. This convergence is determined by precession. It should be noted that the Sun conjuncts the Sacred Tree on December 3, 755 AD; however, precession has caused the conjunction date to approach the winter solstice. Sky on December 21, 2012 AD. The solstice Sun conjuncts the Sacred Tree, formed by the intersection of the ecliptic and the Milky Way. 30 degree field of vision. 5 degree field of vision. which runs directly trough the center of the Milky Way. Indeed, this alignment has been coming together very slowly over thousands and thousands of years. 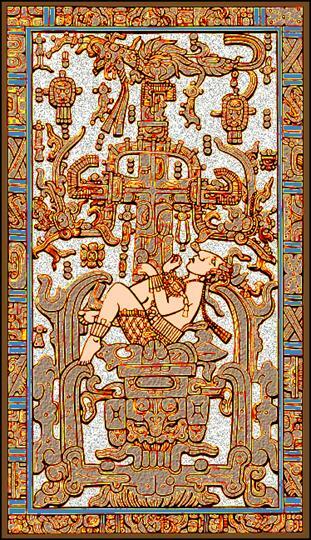 The Maya obviously knew about the precession, as it is automatically accounted for in the Tzolkin which can be expanded to perfectly fit the 26000 tun cycle of the Earth. It is quite amazing indeed to consider that the Mayan astronomers knew the exact date the winter solstice would eclipse the Galactic Center, a event some 2000 years in the future from the approximate time the Long Count was inaugurated. This particular winter solstice represents more than the birth of new solar year. The event is of such significance that it was considered by the Maya to be the birth, not only of new Great Cycle World Age, but of a whole new Grand 26000 tun Precessional Age. In the context of interesting physical phenomena and alignments, there are several other novel occurrences which we can expect during the year 2012. One will be a very rare solar transit of Venus. That is, on June 5-6, 2012, the planet Venus will pass directly in front of the Sun. Transits of this type occur in pairs every 120 years or so. The next Venus transit will occur on June 8, 2004; however this will only be a partial transit, passing through the lower portion of the solar disk. The Venus transit in 2012 will occur directly through the center of the sun over a period of about eight hours. Also in 2012, Venus will conjunct with Alcyone, which is the central star of the Pleiades system, also known as the Seven Sisters. The Pleiades were an important aspect of the Mayan Civilization. Coincidentally, there is a star in the Pleiades known as Maia. To add to the growing list of novel occurrences, there will be two solar eclipses in 2012. During the first eclipse, which will occur on May 20, the Sun and moon will conjunct the Pleiades. The second eclipse, which will occur on November 13, marks a conjunction between the Sun, the moon, the constellation Serpens, or the serpent. Interestingly, the Pleiades was often associated with the rattle of a snake. The Mayan word for rattle is tzab, and is the same word used for the Pleiades cluster. These two eclipses which will occur in 2012 physically reflect the cosmic orobouros, which is the primordial serpent of eternity represented as a snake swallowing it’s own tail. 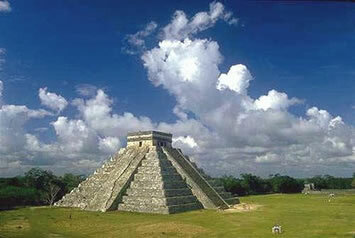 In the area of Chichen Itza, the Classic Maya constructed the Pyramid of Kukulkan. 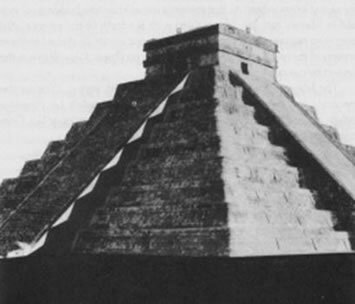 This magnificent structure was specially designed so that every year, on the spring equinox, the sun creates a shadow along the steps of the pyramid which gives the illusion of a huge serpent descending from the sky. This event commemorates the prophetic return of Kukulkan/Quetzalcoatl, the Plumed Serpent. The Pyramid also symbolizes the zenith passage of the sun which takes place over Chichen Itza on May 20, exactly 60 days after the spring equinox. On May 20, 2012, the zenith passage of the sun coincides with a solar eclipse which conjuncts the Pleiades, as mentioned above. This day on the Tzolkin is 10 Chicchan, which means serpent. These highlights concerning physical events which will occur in 2012 indicate the concrescence of novelty, a factor which signals the forthcoming ascension of the entire Earth, including the human race, into higher-dimensional levels of synchronic resonance. of a serpent descending the pyramid. At this stage in our evolution it is obvious that we are approaching the Crossroads of destiny. That is, collectively as a species, we have a choice to make. One path leads to a whole new beginning and rebirth, the likes of which we have not seen since the Big Bang. The other path is a dead end. The human race today is burdened by many things; such as starvation, suffering, war, corrupt governments and banks, disease, and manic-depression. However, the cause of all our problems can be summed up quite easily. Humanity has fallen out of the garden. In other words, we have lost touch with our connection to nature, and the rest of the Universe. In fact, we have deliberately turned our backs on Mother Nature and have erected a grotesque civilization centered around a few patriarchal figures which have been duly exploited by greedy-eyed selfish ego-maniacs. If this attitude is not checked, the human race will not be allowed to enter the next stage of evolution. Our mother awaits our return compassionately with open arms, but will we hear her call? Fortunately, the fundamental misconception of reality which has lead us into separation and disharmony has now been identified and radical efforts are now taking place around the world to bring humanity back into right-alignment with the natural rhythms of creation. This may sound like quite a stretch, but it is actually very simple. Let’s cut to the chase. Our relationship with nature is connected to our perception of time. 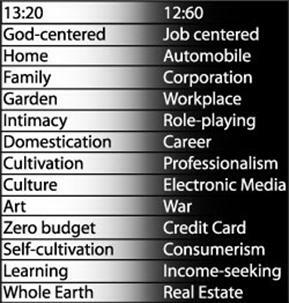 Currently, humanity is functioning on an artificial, unnatural, timing frequency. This artificial timing frequency is characterized by the use of an irregular, and illogical, 12 month Gregorian calendar system. Although this period roughly approximates the length of a solar year, the months are irregular and do not synchronize with any natural cycle. Furthermore, our system of time is based on artificial units we call seconds and minutes. We as humans are forced to sell our time in exchange for an artificial creation we call money, which in turn is then used to buy all the products we are programmed to think we need which are being sold to us. We’ll guess what? We don’t need what they’re selling us. This is exactly what the dominators don’t want you to know. Consider the rest of biological life on Earth. All creatures obtain everything they need in order to survive from the natural abundance which exists within each respective level of Nature’s harmonic balance. Why do we doubt that we would be any exception to this Universal master plan? Thus, the “12 month : 60 minute hour : time is money” equation has resulted in a severe case of amnesia in which humanity has forgotten that we are all cosmic being eternally connected to the Source of All That Is. This Source lovingly provides for everything you need and much, much more once you have surrendered your ego and cultivated trust in the One Great Spirit. What the Mayan’s left behind was more than a bunch of astronomical calculations. They left for us the key which can be used, now at this critical point, to transform our entire understanding of reality. This key is none other than the Tzolkin. Specifically, the 13 numbers and 20 symbols which create the Tzolkin can be used as a natural timing frequency. But what is natural time, as it appears most of us have forgotten? Natural time is based on the relationships of organic and natural processes, such as the motion of the stars, planets, and galaxies, the biological rhythms of plants and animals, as well as the subtle inner-dimensional movements of consciousness and mind. It should be obvious that the artificial timing frequency in question bears absolutely no connection to any natural cycle. On the other hand, we have seen that the natural timing frequency of the Tzolkin accounts for just about every conceivable cycle of nature across all scales and dimensions. The ratio of the 13:20 natural timing frequency is not specifically a Mayan invention. The 13:20 represents a Universal timing frequency which synchronizes the whole of creation from the infinitely large to the infinitely small. The Tzolkin is a self-existing system of ratios which codes for all forms of being in relation to themselves and to each other. In effect, by resonating with this frequency, one is naturally synchronized with one’s self in the present moment. On the other hand, the 12:60 artificial timing frequency alienates one from the present moment. In the Now, one realizes that the Self is infinitely interconnected with everything else that exists, has existed, and will exist. Most importantly, our perception of linear time is an illusion. In the broadest sense, everything exists right Now. The survival of the human race requires that we all return to natural time. Presently, there is a huge collective movement occurring around the world which is based on the teachings of natural time and Universal peace. This movement’s primary objective is to actualize a complete calendar reform, replacing the Gregorian calendar with the 13 Moon calendar. 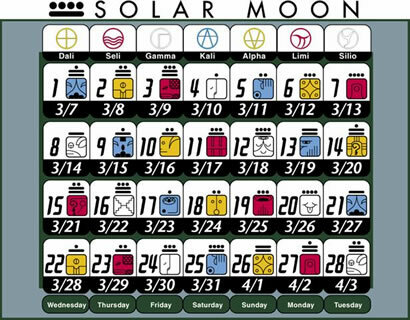 The 13 Moon calendar reflects the natural cycle of the thirteen month lunar year, and is, in fact, a cycle used by all indigenous cultures present and past. Amazingly, human understanding of lunar phases can be traced back to around 25000 BC. The fundamental significance of the 13:20 (natural) and 12:60 (artificial) frequencies has only been decoded quite recently as of December, 1989 AD. This discovery is the result of a specially engineered time-release prophetic mechanism that was built into the Temple of Inscriptions, the tomb of Pacal Votan. Within the tomb, there is a small hollow stone duct which travels from the tomb itself, across the sarcophagus lid, up some seventy feet along the secret stairwell, and terminates at the top platform of the pyramid. The archeologists who discovered Pacal’s Tomb did so only because they noticed a small curious looking stone tile along the inner chamber of the temple. This tile was actually a portion of the stone duct which descended into the tomb. In this way, the archeologists discovered that there must be a secret passageway into the lower part of the Pyramid. After three years of work they reached the tomb of Pacal Votan. The hollow stone duct is called Telektonon, which means Earth Spirit Speaking Tube or the Talking Stone of Prophecy. Thus, the discovery of Pacal’s tomb in 1952 AD fulfilled the purpose of the speaking tube. The opening of the tomb in 1952 AD occurred exactly 1260 years after it’s dedication in 692 AD. From the dedication of the tomb to the end of the cycle of thirteen baktuns, 2012 AD, is exactly 1320 years. The Telektonon prophecy of Pacal Votan essentially asserts that without replacing the Gregorian Calendar with the Thirteen Moon Calendar, the human race will forfeit its future by triggering a biospheric collapse. The Earth Spirit Speaking Tube extends all the way down into the crystal heart of Gaia Herself and allows Her to communicate directly with any individual being through synchronic alignments of various dimensions. Her voice is being heard now by all those who listen with an open heart. The end of the 5th Sun was interpreted by the Maya to be the time of the release of the soul from the density of matter through a cosmic awakening of the divine plan. My intuition tells me that I came to Earth to celebrate Her birthday. It’s difficult to explain exactly who she is because she’s got quite a multidimensional personality. For me, right now, the usage of Her can be interpreted as Gaia, Qeutzalcoatl/Kukulkan, Krsna-Radha, Christ, Great Spirit, Buddha, Cosmic Mother, Ja, Blue Star Kachina, Osiris, Shiva, One Hunapu (First Father), and Hunab Ku. However you look at it, the galactic synchronization means birth, big-time. On Dec 21, 2012, the Sun will be on the Cross, a Universal symbol of resurrection. The doorway through the center of the Galaxy and into Eternity will be completely open. All of these figures, symbols, and metaphors are actually coded messages designed to reawaken the frequency of infinity within the hearts of each and every member of mankind. According to the Zuvuya principal, all things will be synchronized and reconnected back with their Essence Self, which exists Now eternally beyond space-time as the Luminosity of the Infinite Being. Its only a “matter” of “time” that appears to separate us from the infinite potential we are destined to actualize for the good of all beings. N:ow is the intersection of Hunab Ku’s infinite dimensional Universal Heart. 2012 is right N:ow. Right now humanity will witness the dawning of the 6th Sun of Consciousness. The Great Convergence of the Three Jewels is a collectively synchronized unification of galactic, solar, and planetary levels of consciousness. The Great Convergence marks the attainment of critical mass within human consciousness, thus effectively triggering the human collective imagination as an extension of planetary consciousness within the context of a galactic community. This also relates to the harmonic ascension of planetary reality into the next highest octave. As the Hunab Ku mixes the matrices of realities into the fourth dimension of Love, our civilization will transform into a multi-dimensional galactic culture founded on natural time, based on universal telepathy, and held together by art. Light Technology is based on love, and can be used in right-alignment with the Source to create anything imaginable. Tell your friends. Time doesn’t equal money. Time equals art. This spaceship runs on Love. “As the ship’s drive approaches infinite improbability, it passes through every conceivable point in every conceivable universe simultaneously. You select your own re-entry point.” Hitchhikers Guide to the Galaxy. If we look back into the tapestry of time we can pick out a couple interesting events which mark significant breakthroughs in consciousness and technology. For example, the birth of agriculture during the Neolithic Revolution, roughly 11000 years ago, signaled a major turning point for mankind. The invention of the wheel and written language between 4000 – 3000 BC also represent significant advances in human technology. Likewise, the Industrial Revolution, which occurred roughly 300 years ago represents another turning point in the wave of time. Most recently, we have crossed through the Computer/Information Revolution which occurred only 30 years ago. There are a few important aspects of this unfolding picture that we may want to consider. Each period of the harmonic time wave, that is to say periods between major advances, is increasingly shorter in duration than the cycle which preceded it. Also, each respective period of the time wave is characterized by accelerated levels of new things happening faster and faster and in unprecedented, unpredictable ways. If we project this pattern of acceleration into the future, we find that the rate of ingression into novelty becomes mind-boggelingly exponentiated in a very short period of time. For instance, we can expect a 400 day cycle in 2011-2012 when we will experience more transformation than in all the previous cycles combined. Similarly, a 6 day cycle before the Dec 21, 2012 date will exhibit even more dramatic levels of hyper-accelerated transformations. There is a dwell point here in our near future which attracts everything like a Black Hole, indeed the conceptual interplay of various dimensions at the crossroads of 2012 seems to reflect the nature of a singularity. In the last 135 minutes before we encounter this singularity, 18 such transformations, comparable to the appearance of life and the invention of language will be crossed. Thirteen of these evolutionary quantum leaps will be crossed in the last 75 x 10 -4 seconds of the Great Cycle. I imagine we will witness the end of third-dimensional existence. I imagine we will realize what it means to be human. I imagine we will realize what it means to die. Moreover, I imagine we will realize what it means to be consciousness. To summarize, I imagine we will realize what it means to be light vibrations of eternal divine love. Each one of us will encounter our True Self. This will be the fulfillment of an ancient promise we made to ourselves a long, long time ago at the other end of time. I imagine that the human race will consciously realize the broadest sense of infinity. In fact, there’s no doubt in my mind because in the broadest sense, all this has already happened an infinite number of times. The key is to remember that it’s all One Love. In closing, I’d like to state that everything contained in the project is make-believe. Imagination creates reality, so create your reality with imagination. The fruit is in the seed. Do you remember? ”Evam maya e ma ho” All hail to the harmony of all mind and nature. Abraham, Ralph. Chaos Gaia Eros. Harper SanFransisco. 1994. Arguelles, Jose. Surfers of the Zuvuya. Sante Fe, NM: Bear & Co. 1988. Arguelles, Jose. The Mayan Factor: Path Beyond Technology. Sante Fe, NM: Bear & Co., 1987. Balin, Peter. The Flight of the Feathered Serpent. Arcana Publishing Co. 1978. Bryner, Michael and Ariel Spilsbury. The Mayan Oracle. Sante Fe, NM: Bear & Co. 1992. Edmonson, Munroe S., trans. The Book of the Chilam Balam of Tizimin. Austin, TX: University of Texas Press, 1982. Mckenna, Terence and Dennis. The Invisible Landscape. Harper SanFransisco. 1975. Tedlock, Dennis, trans. Popul Vuh: The Mayan Book of the Dawn of Life and Glories of Gods and Kings. New York: Simon & Schuster, 1985. 13 Moon Natural Time Calendar. Ben 4 Productions, 2000.